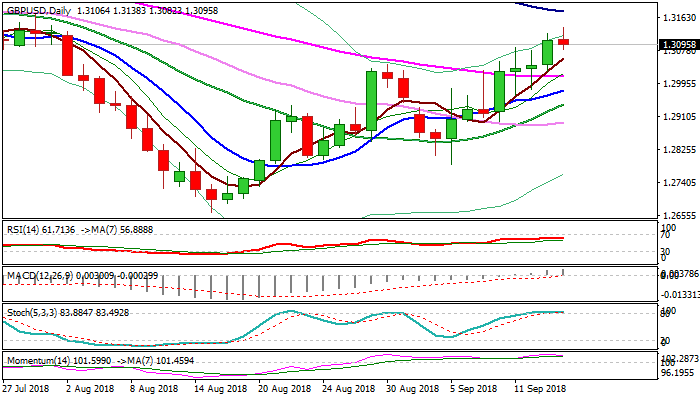 Sterling fell across the board in mid-European session trading after announcement that Britain’s Labor party will vote against any Brexit deal reached by PM Theresa May. Labor party expects that their decision would result in no viable deal in divorce process between the UK and the European union, which would force PM May to step down from her position before Christmas. Fresh political turmoil in the UK comes just days after calming and optimistic comments from top EU Brexit negotiator, increasing volatility in the markets. Cable dipped back below 1.31 handle, trading in the middle of daily cloud after fresh bulls cracked cloud top earlier today. South-turning overbought daily slow stochastic and weakening momentum warn of deeper pullback, as sentiment was soured by recent news. Consolidation within daily cloud would keep bullish bias in play for renewed attempts higher and attack at falling 100SMA (1.3178) on break above cloud. Conversely weaker tone could be expected on return and close below cloud base (1.3043).